Yesterday, around 2pm, Brett, Emri and I arrived back, safe and sound in our new home. My wonderful parents took Emri to play at their house while Brett and I slept for a good 6 or 7 hours. THANK goodness. I don't think I have felt that tired since the week Emri was born. Baltimore was....lets just say "different" this time around. Emri is of course older and declaring her independence...loudly. The plane ride to Baltimore proved to be somewhat trying this time. Emri doesn't exactly sit still anymore and vocalized her discontent in a rather intolerable fashion. By the time we arrived in Baltimore, Brett and I were exhausted and ready for bed. Emri, however, was filled with joy to be off the plane, putting a halt to our dreams of crawling into bed and drifting off into a beautiful night of much-needed sleep. We did eventually get sleep and woke up to enjoy our Saturday. We walked around Baltimore, enjoying the 40 degree difference in weather since the last time we visited. We saw Baltimore's terrific aquarium and enjoyed the first 45 minutes of it until our little munchkin decided she had seen enough. 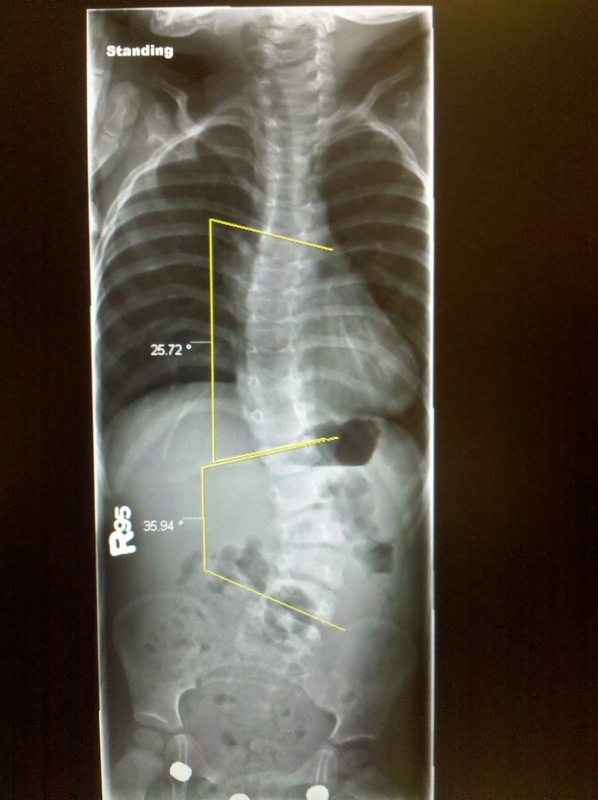 Monday was Em's spine x-ray and consultation with Dr. Sponseller. The x-ray was disappointing yet not unexpected. Emri's spine is getting worse very fast. Fast enough that she will soon be a very young recipient of a spinal rod. 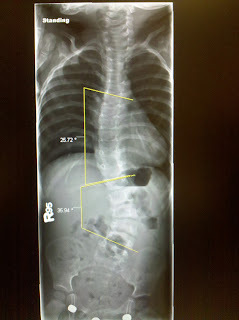 We were really hoping that we could grow Emri up a lot more before she had spinal surgery, but her scoliosis is telling us otherwise. 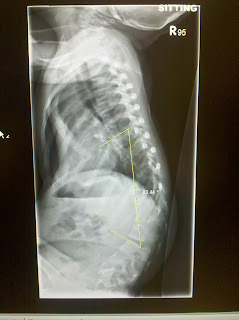 Emri's scoliosis has gone from 13 degrees last January, to 26 degrees in July, and is now at 36 degrees 3 months later. That's only speaking of her scoliosis. 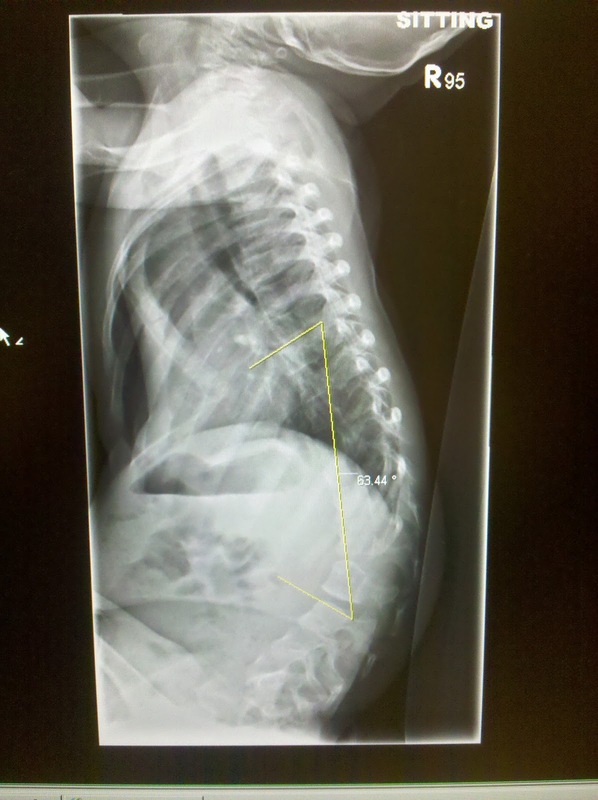 Her Kyphosis measurement (the bump on her back where her spine bows out) is now at 63 degrees. We were less than thrilled with the news that Emri will most likely need a spinal rod around 3 years old, or perhaps even before, depending on how her spine progresses. Consequently, our next trip to Baltimore will be for her surgery. The surgery includes attaching a rod along the entire spine with screws and bolts and lengthening it yearly as she grows. This means Emri will be for sure having a once-a-year surgery until she stops growing. Tuesday was the echo-cardiogram and metting with Dr. Dietz. The echo showed that Emri's aortic root had expanded a couple millimeters. This, also, was not the news we we hoping to hear. We are thankful that it wasn't a large growth, but we were really hoping that the losartan would completely stop the growth of the aorta. The good news is that the mitral valve prolapse is still minimal and we hope it stays that way! We met with Doctor Dietz to discuss all of our and his concerns and it was, of course, very informative. Because of the aortic growth, Dietz changed Emri's losartan to irbesartan. This is a medication in the same class as losartan but can be given in higher doses. Dietz has given it to many marfan patients where losartan hasn't quite done the trick. We will be switching to irbesartan soon and taking it along with atenolol (blood pressure lowering medication) in hopes that Emri's heart will stabilize and completely stop growing! There's the news folks. It was a tough trip. Not only because we didn't get great news, but also because there is so much going on in our marfan world right now. Emri's friend Brody was in the hospital with pneumonia and is now in heart failure. Brody and his parents are flying to Hopkins tomorrow and Brody will have emergency valve repair surgery on Monday. Brody is a couple months younger than Emri, so heart surgery sounds a little intimidating to his mom and dad. Klaire and Kylah, a pair of twins less than a year old with marfan syndrome, are also in heart failure and will need surgery very soon. Danny, our little friend from the UK, just underwent glaucoma surgery and is dealing with a plethora of health concerns due to his infantile marfans. Ashley Hood, a mom I am friends with on facebook, just last week, lost her 7-month-old son who also had marfans. I can't even imagine. Needless to say, there is a lot of stress, sadness, and heartache that I read about daily in my conversations with my wonderful group of marfan moms. It has been difficult to keep my head up lately. The only way I can is when Christ gives me the strength. Satan has been working hard lately to destroy any feelings of peace or contentment I may have. I have been feeling a little angry, utterly defeated, and completely overwhelmed by everything going on. I am praying for peace, energy and help in trusting that God is working for our good. I have been thinking on a verse I read right before our trip to Baltimore. It is Hebrews 4:14-16. "Since then we have a great high priest who has passed through the heavens, Jesus, the Son of God, let us hold fast our confession. For we do not have a high priest who is unable to sympathize with our weaknesses, but one who in every respect has been tempted as we are, yet without sin. Let us then with confidence draw near to the throne of grace, that we may receive mercy and find grace to help in time of need." Jesus went through it all. God GAVE up his only Son. He gets it. "Count it all joy, my brothers, when you meet trials of various kinds, for you know that testing of your faith produces steadfastness. And let steadfastness have it's full effect, that you may be perfect and complete, lacking nothing." I can't, on my own, choose to be joyful in these kind of situations, but I can pray that God grants me His grace and gives me the ability to be joyful through it all, knowing that in the end, steadfastness will come. I love my little Emri more than I can possibly explain. She brings an immeasurable amount of joy to my life daily. It hurts so bad to know how much she will have to overcome and defeat, even in the first few years of her little life. But I know what to cling to, and what to pray for in order to be content and receive joy through it all. You can bet that this is what I will be teaching Emri as she grows and questions the trials she is facing. I thank God for his promise to grant us mercy in our time of need...if only we are willing to draw near to the throne of grace. Even under "normal" circumstances, parenting is riddled with anxiety for these beautiful little people that we love so much. Your journey has extraordinary challenges and a demonstration of great faith. I'm thankful for Emri's sweet spirit and the trust in a good God of her parents. Hi. We wanted to thank you for sharing this challenging journey as you strive to walk this path. Your reliance on our faithful Lord is an encouraging testimony. We actually live in Baltimore and would love to be of any assistance to you all during your future trips here. We live just 5 blocks from Hopkins, where Kyle is a surgery resident and I work as a physical therapist on an as needed basis. We graduated from Dordt in 2004. I was good friends with Amanda through high school and college and we knew Scott and Kyle from Dordt as well. PLEASE do not hesitate to contact us. We have a home for your stay in, little girls for Emri to play with, and offer free Baltimore tours everyday of the week. :) Kyle and Brett are friends on facebook so feel free to shoot him a message. We will keep you and Emri in our prayers!